I took a little break from working on this mod. I actually got some sunlight, hitting the gym more, actually playing games! I am back, refreshed and ready to code! I will be reviewing what I have already done, and update my todo list. After that, I will update the Curse information. Have a suggestion? Idea? Send me a message and tell me about it! 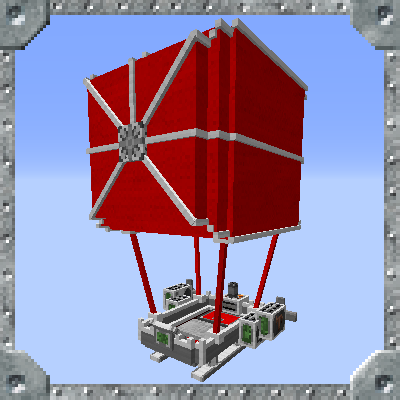 So is there a way to save the air ship upgrades to the air ship spawner? Any upgrades should be saved when you convert airships back into items. This isn't happening for you? This mod works perfectly and it rocks. Future plans sound awesome. could you add a setting along wit the ones you mention where if your ship dies, it gets converted into a fixed block (wreckage) which cant be put into a the pocket or moved or anything till its fixed. And let bad weather be dangerous if that's possible. Air raiders are definitely a plan. Thanks for the compliments! I am thinking about how to handle broken machines. 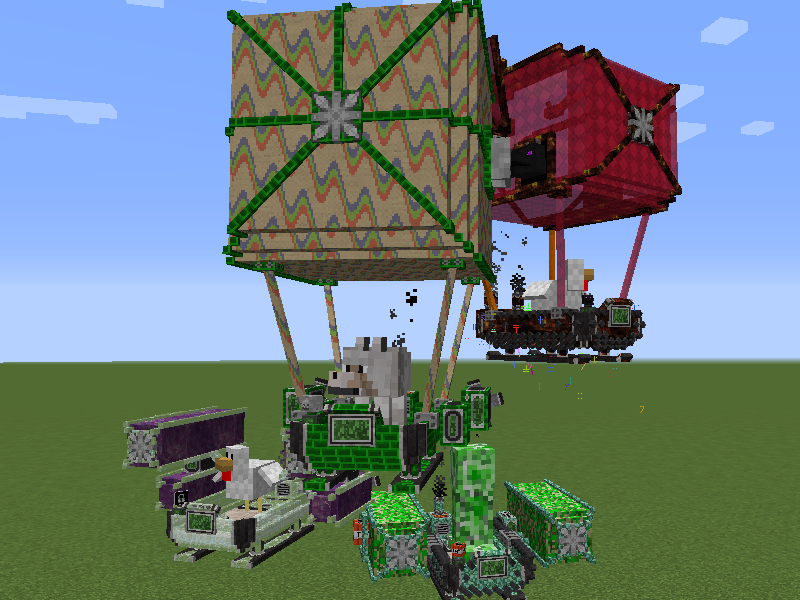 So far, an airship will fall like a rock after it explodes and can't be moved. You can get in it still to interface with the airship's gui, and you can convert it back into an item (a broken version), but you have to use the repair tool on it when it is spawned in the world. I really like the idea of making weather dangerous. I can put something in that maybe takes altitude (higher is more dangerous), the upgrades and airship has (better airships have more insulation? ), and random chance can all play a role to see if lightning will strike the airship. I could create a module that would prevent lightning strikes, or maybe could use lightning strikes as speed or fuel boosters? I have a lot to think about! Awesome, dude!! Those upgrades sound cool! This mod is fun, dude. You should make some of those upgrade wear after abuse also. I made my base themed off my Vies ship. That's how much this mod rocks. I have a hanger in a cave hidden by a waterfall curtain which can be turned off using pistons. I think your future plans are a great idea - I am looking forward to seeing how it goes! Thanks! It is a lot of work but I feel it is so worth it. So far, I love all of the changes and have so many ideas. Things feel more integrated. More real. I think to start, I will just have the airships, then expand to more Flying machines, then the Water machines, then ground machines. I feel really dumb for asking, but I've read through the in-game book and looked for other documentation elsewhere. I updated the mod and with the new airship system, I can't figure out what I'm doing wrong- I've made a basic airship, no upgrades, added redstone and fuel, and tried flying- besides moving horizontally, nothing happens, it won't fly. Just sits there and wastes fuel. Is there something else I'm supposed to do? I'm pretty confused. Edit- Okay, I feel even dumber ahah. I think it's because I'm starting out at a higher elevation than the default allows. Haha, I don't know why I keep forgetting to update the recipes in the guidebook! It is fixed as of 5.9.13. :) Thanks for letting me know! The back 2 supports were like that by design. Before this update, I had pipes on all models. That was a pipe I didn't take out yet. I can fix that. Thanks! This is now fixed and will be in the next update. It should be released later tonight. Want to see if anything else comes up throughout the day. Heya! Cool update, minor complaint. Thinking about it, that is a lot. I am going to make a change and come out with another update. :) Instead of using the previous upgrade, it will just be the base item so for the core upgrades, it will be the airship ignition. Thank for the input!